Fashion and architecture are no strangers: just ask Zaha Hadid. 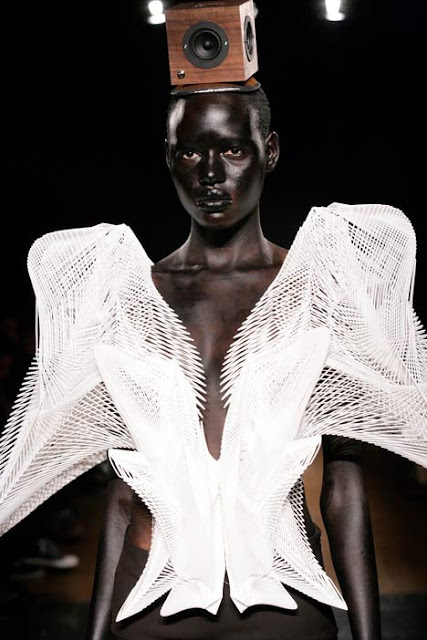 But nothing I've seen is quite as impressive as this collaboration from London architect Daniel Widrig and Dutch fashion designer Iris van Herpen. This 3D-printed collection is titled Escapism and was manufactured by .MGX by Materialse to show at Paris Fashion Week earlier this month. The sculptural printing technique results in garments with no seams, which means there is absolutely no sewing involved in the construction. Pretty amazing, no? I'm a total sucker for collaborations between the design disciplines. Are there any fashion designers/interior designers/architects you would like to see working together in the future?